Choose 300g or 100g size. A French scientist first discovered creatine in 1832, but it was not until 1923 that scientists discovered that over 95% of creatine is stored in muscle tissue. The first published report of creatine having bodybuilding effects was The Journal of Biological Chemistry in, get this, 1926! Although we’ve known about creatine for quite some time, the first real use of it to enhance performance was the 1992 Olympic games in Barcelona, Spain. Creatine is 100% natural and occurs naturally in many foods; therefore, it can never be banned from any sports or international competitions (unless they banned eating meat)Many foods especially herring, salmon, tuna, and beef contain some creatine. However, the very best source of creatine by far is creatine monohydrate because it contains more creatine per weight of material than any other source. Creatine is bodybuilding’s ultimate supplement, and for good reason. For one thing, creatine can significantly increase lean muscle mass in just two weeks. It is also responsible for improving performance in high-intensity exercise, increasing energy levels, and speeding up recovery rates. It’s no wonder athletes who use it have such of an edge over those who do not. Creatine’s ability to enhance energy reserves in muscles comes from its muscle protein synthesizing action, while minimizing protein breakdown. This occurs because creatine has the awesome effect of super-hydrating muscle cells with water. It enhances muscles’ growth too-making muscle fibers bigger and stronger. Many studies have been done on creatine to figure out why and how it works so well. There have been over twenty double blind studies conducted on creatine in the past five years. They proved that creatine increased energy levels, resulting in increased strength, endurance levels, and recovery rates. Another unexpected benefit attributed to creatine was discovered as well: creatine accelerates fat loss, while building lean body mass! The best part about creatine-no adverse effects have been reported in any studies. NONE! Creatine is totally safe and effective. Creatine has never been shown harmfully toxic. Nevertheless, just like with anything, it is not recommended to over-supplement once your muscles are saturated with creatine-there is no reason to. This means, stick to the recommended dosages, drink plenty of water and be prepared to experience fantastic muscle, strength, energy, and endurance gains! The experiment tested this hypothesis by giving the one group of subjects a creatine supplement and a second group a placebo for six weeks, followed by a six week period with no intake and a final six week period when the control and placebo group were swapped. Intelligence and memory were tested at four points: the start of the trial; the end of the first six week period; and the start and endpoint of the final six week period. Unlike steroids or drugs, creatine is 100% natural and occurs naturally in many foods; therefore, it can never be banned from any sports or international competitions (unless they banned eating meat). Many foods especially herring, salmon, tuna, and beef contain some creatine. However, the very best source of creatine by far is creatine monohydrate because it contains more creatine per weight of material than any other source. Creatine is bodybuilding's ultimate supplement, and for good reason. For one thing, creatine can significantly increase lean muscle mass in just two weeks. It is also responsible for improving performance in high-intensity exercise, increasing energy levels, and speeding up recovery rates. It’s no wonder athletes who use it have such of an edge over those who do not. Soon nearly every athlete who competes will use it (if they don't already). Creatine's ability to enhance energy reserves in muscles comes from its muscle protein synthesizing action, while minimizing protein breakdown. This occurs because creatine has the awesome effect of super-hydrating muscle cells with water. It enhances muscles' growth too-making muscle fibers bigger and stronger. Excellent results have been observed in taking creatine monohydrate in two different ways. The first way is called loading. This method works very well for anyone who has never taken creatine before. Just as the name implies, it involves loading up or saturating your muscles with creatine. During the first four days to a week, take 20 to 30 grams per day. Mix it with non-acidic juice. Grape juice works well. Gatorade may also be a good choice as there is some evidence that the electrolytes may also help with uptake. After this loading period, take a regular intake of between five to fifteen grams per day to keep your muscles saturated (no need to over do it). The other method is a more gradual approach to supplementing with creatine monohydrate. Over the course of an extended period, one basically skips the loading phase and just supplements with five to fifteen grams per day, everyday. The best results have been noticed when creatine is combined with a high carbohydrate base, such as dextrose (glucose) and taken about one-half hour before training. Q: Creatine supplementation seems to increase muscle strength. Would it make a person's heart stronger since it is a muscle too? A: Research has shown that the cardiac tissue of laboratory animals does, indeed, take up creatine; not to the same magnitude as skeletal muscle but to some degree. There are reports of patients with chronic heart failure having low levels of myocardial creatine, and in that situation, administration of creatine is beneficial. A: Many scientific studies have been published and presented about creatine over the past years, and we have never seen any scientific evidence that creatine increases an athlete's chances of experiencing muscle cramps or "pulls." In fact, results from one recent study conducted at the University of Memphis (entitled "Effects of Creatine Supplementation During Training on the Incidence of Muscle Cramping, Injuries, and GI Distress") revealed no reports of muscle cramping in subjects taking creatine-containing supplements during various exercise-training conditions. Among the test subjects were elite junior swimmers, college football players, and trained and untrained endurance athletes. A: the bloodstream can absorb Powder more efficiently than a pill, which has a coating that must be digested first. Also, creatine is taken in gram amounts-which means, you'd need to take 20 1-gram capsules or 40 tablets per day to load. Needless to say, powder is much more efficient. A: No. Creatine has no caloric value. Some of the new fancy designer products have different types of sugars added i.e. 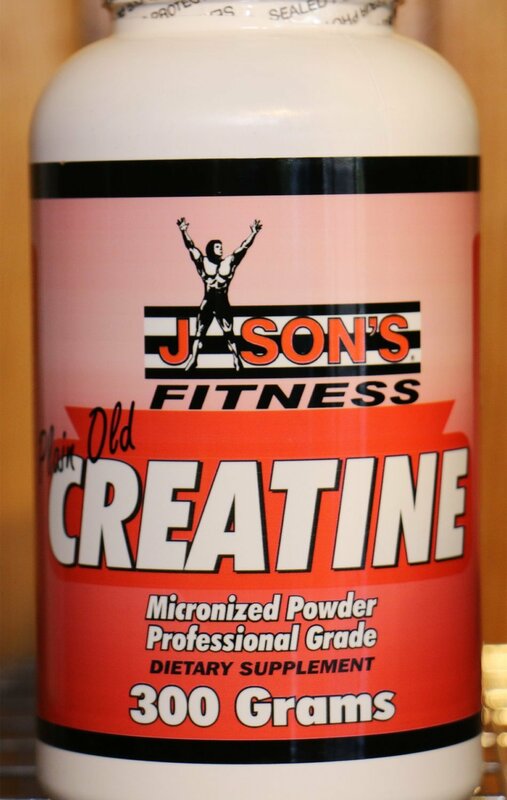 Celltech, but Jason’s Plain Old Creatine was named that for a very good reason. It is just pure pharmaceutical grade creatine and contains nothing else including calories! Athletes on creatine might overtrain and might hurt themselves, but this would be the result of the athletes expecting to do more than they can,Volek said. "If you want to go from training four days to training seven days, that could lead to overtraining, but that's not creatine's fault," he said. Research undertaken by scientists at the University of Sydney and Macquarie University in Australia has shown that taking creatine, a compound found in muscle tissue, as a dietary supplement can give a significant boost to both working memory and general intelligence. The work monitored the effect of creatine supplementation on 45 young adult vegetarian subjects in a double-blind, placebo-controlled experiment.